we could wander and play in their home. Five years after I was born, my brother came along. I almost drowned because of him. Well..., I suppose it was because of my own recklessness, but my father was unable to rescue me because he was holding my baby brother in his arms. That same day I gave up racism. 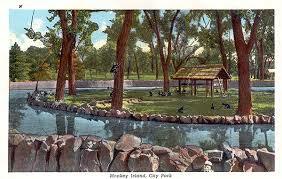 The Denver Zoo is in City Park but, during the summers of my childhood, an island in Washington Park Lake became part of the Zoo. The lake had a wooden walkway between the island and the shore. All fall, winter, and spring, the bridge was in place and we could visit the island, appropriately called “Monkey Island”. In the summer, the monkeys from the zoo were moved to the island and the bridge removed. My childhood mind was sure the monkeys were as thrilled by this arrangement as I was. We would picnic on the banks of the lake and watch them enjoying their island home. I could imagine being right there with them, romping through their world and swinging through the trees. I remember loving Monkey Island with or without the monkeys. I am not sure which I thought was better. One early spring day, when the monkeys were not yet on the island, I begged for a visit. I was nearly six years old and already thought of myself as a grand adventurer. My father carried my brother over the bridge, followed by my mother in a dress and heels. I was free to wander the island, led only by my wild imagination. Without calculating how long it would take me to stop, I ran to the edge of the island and fell right into the lake. The lake was man-made with a thick layer of algae that felt like a sea monster grabbing my feet. I was screaming and thrashing. My mother was yelling. My father was trying to pass off my brother to my mother. And, I was drowning. Suddenly, a large black man reached down and lifted me out of the water. All I saw was my rescuer and I am not sure, in the rush of that early 1950’s moment, that anyone even thanked him. I now know that I was in no real danger. I probably could have walked myself back to shore. But, I was convinced he saved my life. Over the years I have thought fondly of that man. I often wonder if the little girl whose life he saved ever crosses his mind. I bet he would be surprised to know I remember him and how much the debt I owe to him changed the course of my life.